This time I sent to Theresa who lives in Oklahoma. As soon as I heard about the tornadoes, I emailed her to make sure she was safe. She lives far enough away that she was not in their path. Praise God! Check out her blog to see how I spoiled (her words) her. Hannah was selected to send to me. She lives close to my favorite zoo and even worked there last year. I’m just a little jealous. Actually I’m a lot jealous. If the zoo wasn’t 1 hour and 15 minutes away, it would be a perfect summer job for me. She worked with the summer camps and I took a teacher workshop there last August. We might have seen each other there. Hubby had wanted honey when we were at the Second Street Market. The honey was from Canal Winchester so it was cool we got it from Hannah. This is so good. I eat a few a time so I can make it last. The boys loved their cookies. I haven’t tried this yet but it looks absolutely delicious. Eiffel tower card – We read about the Statue of Liberty. We learned that the guy who designed the Eiffel tower is the same guy who designed the Statue of Liberty. One of my favorite smoothies at Tropical Smoothie is the Blimey Limey. It has strawberries, limes, oranges, and pineapples. I love the tang of the limes in the drink. So when I found a recipe for a smoothie that used limes, I was had to try it out. Delicious! 2 tbsp. key lime juice (about 4 limes) – I microwaved mine for about 10 secs. to maximize the amount of juice. crushed graham cracker pieces (optional) – Leave off if gluten free or use a gluten free graham cracker. Cool Whip or something similar (optional) – Leave off if dairy free or use coconut cream instead. Place in your blender in the order of the ingredients listed, blend until smooth. Top with crushed graham crackers and Cool Whip, if desired. This made 2 smoothies for me. Someone asked me what you could use instead of bananas. I found this link for other ingredients you can use instead of bananas. Yesterday the Imaginative One and I went to the zoo to check out the new dinosaur island exhibit. On the way there, I saw a sign about strawberry picking so I asked him if he wanted to stop and pick some fresh strawberries. Since he loves strawberries, he told me yes!!!! So I followed the signs and found the farm. The owner showed the Imaginative One how to look for ripe strawberries by sight. Strawberries stop ripening once they are picked. He also told him to check the ripeness by tasting it. So we tried a few freshly picked. YUM!!! We filled the basket to the top and even a few more so that it overflowed. It was an experience that we will not forget. The Wee One was not with us but enjoyed the fruits of our labor. 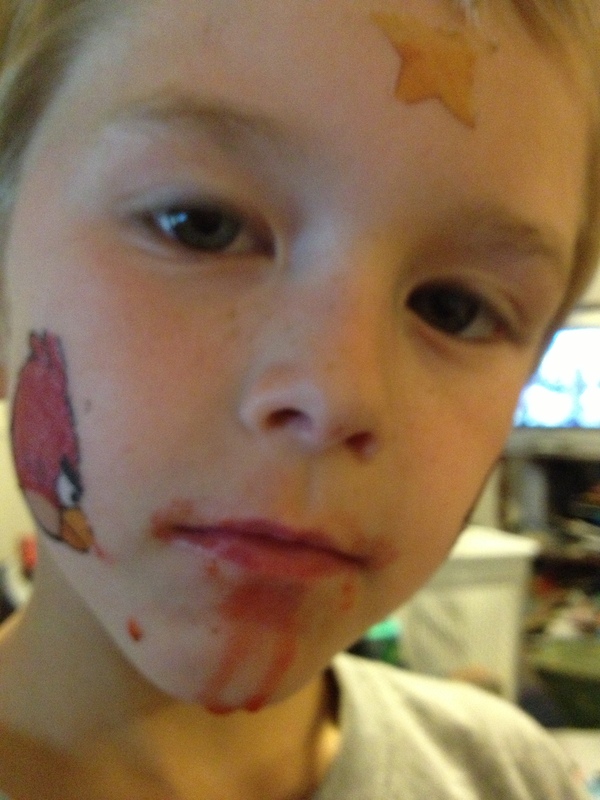 I had to tell him to stop eating the strawberries because I was afraid he would get a tummy ache. 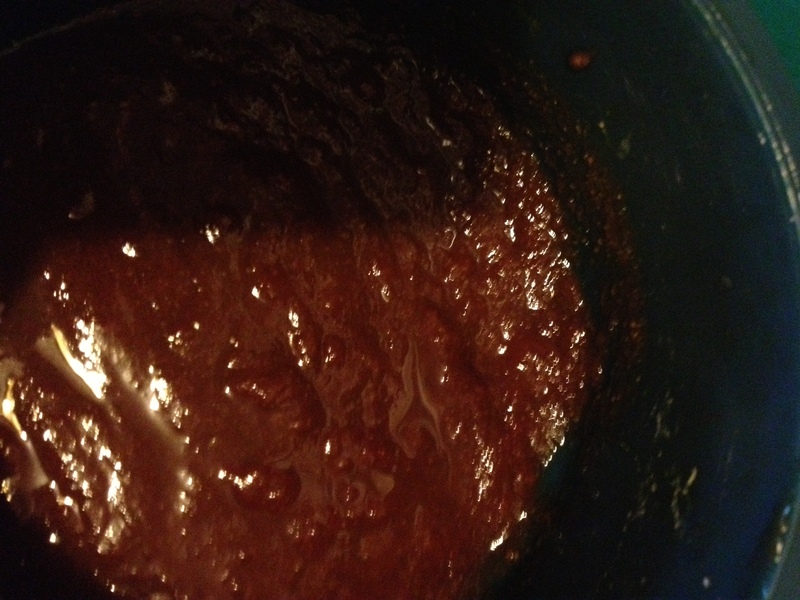 This barbecue sauce is easy to cook and also delicious! Both the Wee One and Hubby gave their seal approval with this sauce. The only issue is that I’m trying to avoid eating or drinking foods or drinks that include high fructose corn syrup. I recently found a ketchup that does not have high fructose corn syrup (Kroger’s organic ketchup) so I used that. The root beer however did contain high fructose corn syrup. My next mission is to find root beer with out the corn syrup. Combine all the ingredients in a sauce pan. Mix well. Bring to a boil over medium-high heat. Stir occasionally. Enjoy with your favorite meat! I heard about the tornado. I am sorry about the people who were hurt or killed. I heard some sad stories but also some stories of real heroes. Like a teacher who was found under a car with 3 kids under her. Also one about a lady who telling about her experience of how her dog who was swept away from her during the tornado. Suddenly they heard a sound and discovered the dog was just hidden under the debris and came out when he heard her voice. I am sure some of the missing people will be found but before they are found let’s hope they are okay. God be with them is my plea. If I could, I would go down there to help search for the missing people and give some of my clothes, toys, books, and other things to the kids who have lost so much. My prayers are with the people who live there. So Friday night, I went out to the freezer to make a smoothie and it was OFF! Argh! Hubby walked on from work and informed me that the breaker tripped a day or so before. He didn’t realize the freezer was on the same circuit. He immediately fixed the problem but since I didn’t know the exact timeline of how long it was off, Saturday afternoon was spent throwing away most of the meat in the freezer. I restocked some of the meat and reorganized the freezer so that was nice. Saturday eating at a World-a-fair We look forward to this every year. I can’t wait to eat the apple dumpling (not its real name) from the Netherlands, baklava from Greece, virgin piña colada from Puerto Rico, and a brats wurst from Germany. The music and entertainment is wonderful. Hubby and I were going to go on Sunday without the boys but they want to go so we are going on Saturday instead. 14 years ago today . . .
Let me take you back further than 14 years ago because that’s where this story begins. It was September of ’97 and the fall quarter at the college I attended. I was running late to one of my classes because I was doing my teaching practicum at a school that was 45 minutes away from my college. I didn’t have a car so I was riding public transportation to and from the practicum. I walked into the the teaching reading class and there was no seats. Hubby was there and practically pushed one of his friends out of their seat. Unfortunately for hubby, the professor found me a seat next to her. A few days later, I had a art class and guess who was in my class. Yes, hubby! A few weeks later, the professor of the art class had a sick family member so 3 classes were canceled. We went over to my dorm room and just talked. 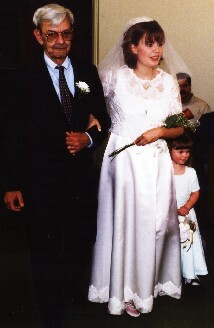 In October of ’97, we began dating. Our first date was at the Spaghetti Warehouse in downtown Dayton. In January of ’99, I began student teaching. During the time I was student teaching, we had a big snow/ ice storm that caused school to be cancelled for multiple days. I ended up visiting at his parents’ house for a week so that I was not in the stuck in the dorms. I also ended up with either a stomach virus or flu. On the day I was sick, he went with his sister to find me an engagement ring. Since school was cancelled was closed for multiple days, my student teaching was extended for about 3 days. My last day of student teaching was St. Patty’s Day. The next day, I had class and all I wanted to do was sleep and rest afterwards because I was exhausted. Hubby was insistent we go out. Since it was a rainy/ dreary day, we didn’t get to go where he wanted to – Glen Helen Nature Reserve in Yellow Springs. Instead we went looking for apartments. He was ready to move out of his parents’ house and I was getting ready to graduate from college in a few months. The first place we visited ended up being nice so he got on knee by the stairs in the apartment and asked me if I wanted the apartment and him. We were engaged! That weekend we went to Pittsburgh to visit my grandma, aunt, and cousin. It was the first time I had been back there in almost 14 years. It was a nice way to celebrate out engagement. Our plan was to live with each other for a year, plan the big wedding, and then get married. My grandpa put a stop to that plan. He basically told us that he didn’t want us living in sin even though we had made a commitment to each other. We decided to follow my grandpa’s wishes of us getting married. 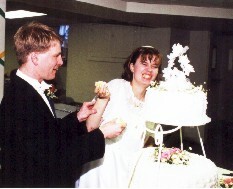 We picked a date that was on a Saturday for the following year and then began marriage counseling. We were going to elope a month and a half after we were engaged. We ran into a snagfu while planning the elopement because we needed witnesses. We decided to ask hubby’s dad and my grandpa. If we asked them, then the rest of the family was going to be there at the wedding. We ended up having 12 people at our elopement. Eleven were family members. One was a family friend. It was a Thursday morning at around 11 am if I’m remembering right. I only had classes on Tuesdays and Thursdays so I took the day off. It was also World Day of Prayer. Our current pastor married us and then we went out to eat at First Watch. That night we went to see Shakespeare in Love. 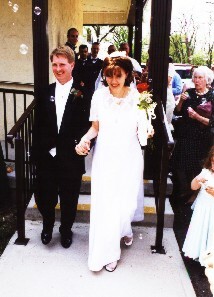 14 years ago, today we were married. Two days later, I turned 24. A month later I graduated from college. A year later, we had our big wedding and honeymoon at Walt Disney World. 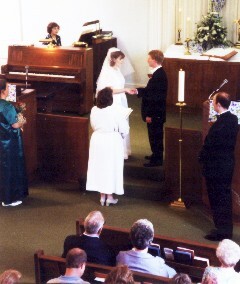 A few months after our big wedding, I began working at my current job. When I decided to marry my sweetheart, it began a snowball effect of life changes. I cannot believe it’s been 14 years!